Since 1958, King Electric has delivered American Made smart comfort solutions to businesses and families through industry innovation, building a legacy of trust, and delivering unparalleled reliability. We believe 60 years of experience matters. As a family owned company founded in Seattle that thrives manufacturing heaters here every day, we have been inspired by our customers to advance our industry through technology. Technology designed to make our products more efficient and offer more precise control. King Electric is the premier North American manufacture of Industrial, Commercial and Residential Electric Heaters and Thermostats, Hydronic Heaters, Electric Heating Cables and Accessories– making us a one-stop solutions provider. We build smarter, more reliable and efficient electric heating products that offer an unparalleled user experience of temperature control, while reducing energy waste. Made in USA Since 1958. We Believe 60 years of Experience Matters. 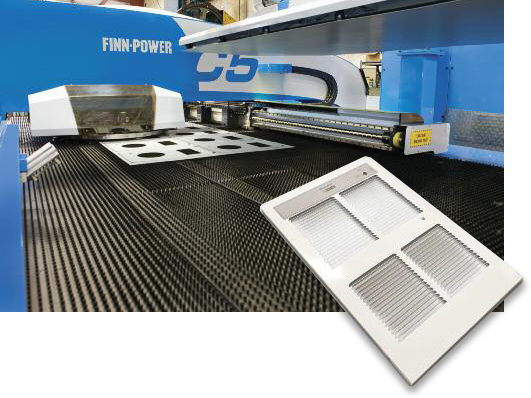 Read about how King Electric’s new automated turret press speeds up productivity and reduces materials usage.